So You Want to Sing Barbershop? The So You Want to Sing series continues to produce books directed to vocalists interested in specific genres. The Rowman & Littlefield series, sponsored by the National Association of Teachers of Singing (NATS), now turns its focus to a cappella and barbershop. “Contemporary crowds may think of the occasional comedic performances featured on “The Tonight Show Starring Jimmy Fallon“. 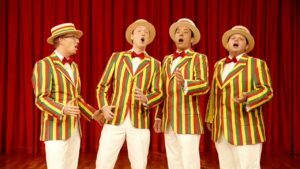 For those with little or no exposure to barbershop singing, the first images that come to mind may be of four men singing close harmonies while wearing red-striped vests, matching bow ties, and stiff-brimmed straw hats. Music theatre fans may think of the school board quartet from The Music Man while contemporary crowds may think of the occasional comedic performances featured on The Tonight Show Starring Jimmy Fallon. More seasoned barbershoppers, however, know exactly what SPEBSQSA stands for and are always ready to bust a chord on any one of the dozens of tags they know by heart. While every book in the Rowman & Littlefield So You Want to Sing series includes chapters written by guest authors, this is the first book written primarily by two co-authors. Co-author Diane M. Clark taught for 32 years on the music faculty at Rhodes College in Memphis and was a professional church musician for 36 years. She has an additional 10 years of teaching experience with Sweet Adelines International (SAI), the largest all-female organization formed to preserve and promote barbershop harmony. She is the former associate director of the Memphis City Sound Chorus, former director of the Grand Traverse Show Chorus, and current director of the Cherry Capital Men’s Chorus. In 2006, she sang with the Metro Nashville Chorus when they were named international champions in the Harmony Classic Small Chorus Division. The other co-author, Billy J. Biffle, has been a barbershopper for more than 40 years, during which time he earned district championships and appeared in international competitions as both chorus director and quartet singer. He has arranged barbershop music, judged official competitions, served on the board of directors of the Barbershop Harmony Society (BHS), and served on the faculty of its flagship school, Harmony University. Together, Clark and Biffle provide a written history of barbershop chorus and quartet singing from its earliest days. As the musical style was taking root in the U.S., 1938 saw the formation of the all-male BHS, which also was given the tongue-in-cheek, New-Deal-parody acronym of SPEBSQSA—the Society for the Propagation and Encouragement of Barber Shop Quartet Singing in America. The BHS grew to peak enrollment in 1983, with 38,000 members across 800 chapters throughout North America and its affiliates in nine foreign countries. In 1945, several women set out to form an all-female barbershop society by sending invitations to the wives of current BHS members. The result was the formation of Sweet Adelines International, which today has more than 3,000 members. More recently, the Mixed Barbershop Harmony Association (MBHA) was established in 2016 as an affiliate of BHS that is open to both men and women. The authors do not gloss over barbershop’s less-than-harmonious past. Despite the fact that the barbershop style likely originated within the African American community, both BHS and SAI adhered to a “whites only” policy until the mid-1960s. It was this policy as well as other disagreements that led several SAI members to break off and form Harmony, Inc. (HI). Chapter 4, “The Barbershop Style,” explains the importance of vowel matching, chord balancing, and the “lock and ring” that reinforces the frequencies of the overtone series. It also spells out the 11 chords primarily used in barbershop singing and defines several common stylistic embellishments. Chapter 5, “Barbershop Singing Technique,” informs readers about what they may expect at a barbershop audition and then delves into alignment and posture, breath management, balanced phonation and resonation, and range and registers, along with other ensemble and performance considerations. These subsections provide suggested exercises for implementing skills related to each topic. Later chapters go further to address the elements of building ensemble (diction, blend, tuning, etc. ), outline the standards used in barbershop competitions, and discuss resources for “Becoming a Better Barbershopper.” The final chapter addresses the emphasis on community building—an essential element of barbershop singing that may not be found to the same degree in other choral groups. Clark and Biffle explain that many chapters’ missions include creating a feeling of family and friendship. In this way, barbershopping provides a more universal, life-changing experience with music even though it attracts people from all professional fields and all walks of life. Additional information from guest authors is included in the appendixes with suggested choral warm-ups, “Ten Steps to a Better Singing and Performing Chorus,” and a step-by-step rehearsal process for how to learn a song. A final appendix is devoted to the famous, groan-worthy barbershop humor, filled with voice-part jokes, ironic one-liners, and storytelling. Learn more about other books from the So You Want to Sing series and peruse the free online resources for each volume at the series website: www.nats.org/So_You_Want_To_Sing_Book_Series.html. Readers also may find additional articles dedicated to the series in previous editions of The Singer’s Library column, which are accessible through the Classical Singer archives: www.csmusic.net/content/issues/. Tenor Brian Manternach teaches voice at the University of Utah in the Musical Theatre Program. He holds degrees in vocal performance from Saint John’s University in Minnesota (BA), the University of Wisconsin-Milwaukee (MM), and the Indiana University Jacobs School of Music (DM). He can be reached at bmantern@gmail.com.